The second of two "shooters," seen above, fired at "hostages" yesterday during a simulated school shooting at McKinley High School. 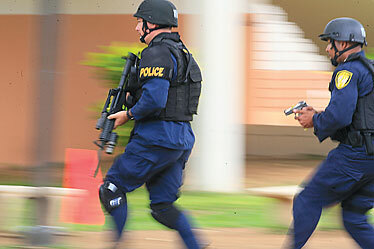 HPD SWAT officers scrambled into action. 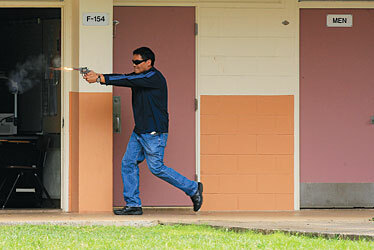 The simulation, which included police, fire and emergency personnel, evaluated and examined the readiness and efficiency levels of rescue task forces during a time when shootings across the nation have become more common in schools and malls. 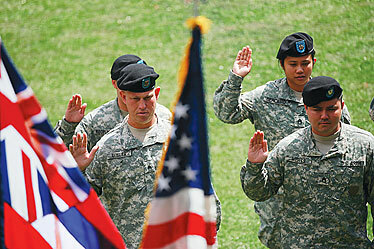 About 15-20 Hawaii Army National Guard members raised their right hands yesterday during a re-enlistment ceremony at Les Murakami Stadium on the University of Hawaii-Manoa campus. The ceremony took place prior to the baseball game between UH-Manoa and UH-Hilo. 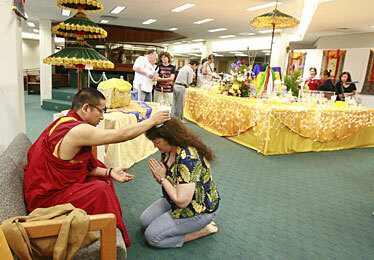 Lama Norbu blessed Dawn Gold yesterday at the Maitreya Project Heart Shrine Relic Tour stop at Kapiolani Community College. The traveling exhibit features Buddhist relics -- small, physical manifestations of enlightened souls -- from the remains of Buddhas, lamas and their disciples. The relics have toured around the globe in a mission of peace and as a means to raise funds to build a 500-foot bronze Buddha statue to house the remains. Today is the last day to view the exhibit, which is open from 9 a.m. to 8 p.m. in the Lama Library on the Kapiolani Community College campus. For more information, visit www.maitreyaproject.org/en/index.html.